Oh Anna Maria, how I love you and your gorgeous Little Folks fabrics! I finally finished up my wonky string quilt and I’m so in love. I can’t even tell you how much I love it. So very much. I made 11″ string blocks using a lime green solid for the center strings. To change it up a bit, I made these strings slightly wonky, sort of along the lines of Denyse Schmidt’s Any Way You Slice It quilt (I just added ‘wonk’ to my strings when sewing them to the paper, though Denyse has a pattern available in her book ).Â All the fabrics aside from the center strings are voile fabrics from Anna Maria Horner’s Little Folks line. I think almost all of the patterns from the line are represented (I can think of one I’m missing…but maybe there are others? I’m not sure…). I had some minor snafus with this one – nothing serious, just a few things that made this take a bit longer than I expected.Â I had a little trouble with the backing — I ended up with a solid in a gold color, which is weird, since gold wouldn’t be my first pick. I made a pieced backing, got the quilt all pinned and then realized that I really disliked the gold more than I first thought. In fact, I disliked it so much that I ended up taking the whole thing apart so I could remake the backing. Then I couldn’t decide how to quilt it, so it sat for a bit while I stared at it and considered various options. I knew I wanted to do a minimal amount of straight line quilting to keep it as soft as possible. I finally decided to go with straight lines on the diagonal, but made them wonky to keep with the wonky aspect of the front. 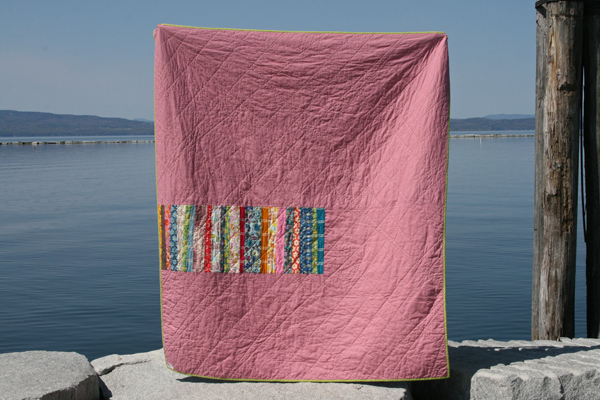 This entry was posted in [search] String Quilts, 2010 Finished Quilts, Finished Quilts, Posts about Quilts, Quilts and tagged anna maria horner, handmade, little folks, modern, quilt, quilting, string quilt, voile, wonky string quilt. Bookmark the permalink. What beautiful quilt! great pics too! You did a fabulous job on it. I love the quilting idea with straightline wonkiness!!!! I’m so jealous of your awesome photography locations! This quilt, as usual, is amazing. I’ve been hoarding a bunch of this line in the hopes of making a quilt for myself. The voile scares me a bit so I’ve been thinking about doing a string quilt as well since the paper piecing gives me more confidence. I’m thinking of hand tying mine with purl thread to keep it extra soft! NOOO, don’t stop! Make lots and lots more!! It came out sooooooo amazing! Where did you take the pics – such a cool spot! Nicely done! Love it, love it, love it! I’m saving all my scraps to make a string quilt because I’m so jealous of all the wonderful ones I see, and yours looks so warm and inviting. Very nice! It looks wonderful, I want to cuddle up with it right now!! You are a quilting machine. 🙂 It’s just beautiful! Those photos are by far some of my favorite yet. 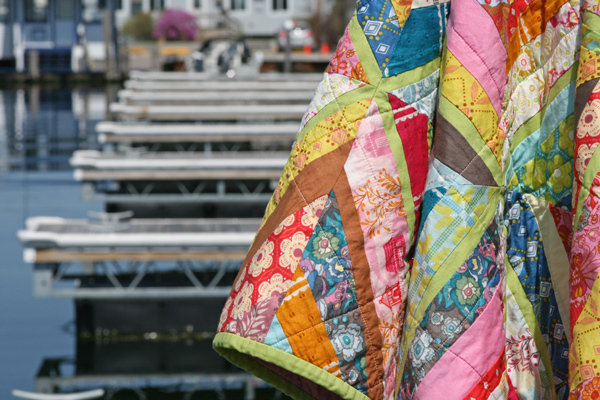 What a perfect day and a perfect location to take pics for this equally awesome quilt. LOVERLY! Now I really want to make one of these! The AMH voiles are so wonderful to work with! Beautiful quilt. Beautiful fabric. And I love the wonky straight line quilting. It’s one of my favorite collections, too. I love this quilt, and the photography is outstanding. (In addition I wanted to tell you that the columns on your blog are overlapping. I use both IE and Chrome and when I noticed a problem, I checked both; and the probelm appears in both.) I looks for an email or contact information, before putting this in a comment, but couldn’t locate one. The photography is really beautiful. (And like Jan’s comments, the columns overlap in my IE as well). Anyway, i have almost the complete line, but I think I need to fill in the holes. And clothing? I would love the dress (in the red pomegranate–at least I think it’s called something like that–the diamond-y one) and a scarf. Just like the one in the picture on AMH’s website. Dreamy. I’m in love….I think this is my very favorite quilt you’ve made ( and I LOVE lots of your creations!) I’m almost done piecing my LF quilt top and the fabrics are so luxurious, but I have had a lot of trouble with their slippery nature. I’m glad yours went along more easily! This is beautitul! You photography and setting as well. This is really a beautiful quilt as is everything you do! I just bet it’s super soft in that voile!! Unfortunately, I don’t know how much I started with (or how many of the prints I used! ), so I have no idea how much of each I used. If I had to guess, I’d say it was probably around a 1/4 yard of each (more of some, less of others…) Sorry I don’t have a more accurate answer for you! Once again you have made a really, really beautiful quilt. I can almost feel trough your photos how soft it is. 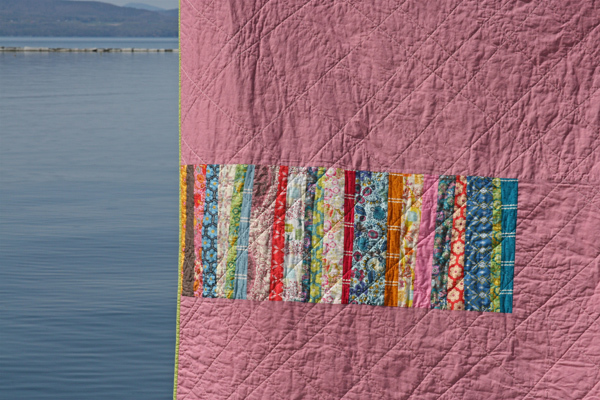 it is gorgeous…and gives me a sneak peak into what one of my little folks quilts will look like. I realized shortly after making my first quilt that I over bought on fabric, so I stripped the left over for a string quilt. It may take a few months before either one is done, but at least I know (from seeing yours) that the string quilt will be beautiful. As usual, I LOVE the back of your quilt. You are so good at making the backs just as beautiful as the fronts!! Can I suggest making yourself a couple spring scarves with the AMH little folks fabric? I just made myself two… because I keep going to my sewing room just to look at the fabric. Now I get to wear it every day! (and I’m not really that great at sewing shirts I’d actually like to wear.) I jut used 1/4 yd cut of two of the fabrics sewn together. The result is a shorter light weight scarf for spring. Oh I love it. I posted pics on my blog if you’d like to see (http://mommysnaptime.blogspot.com). Also, all your little folks quilts really inspire me! Absolutely gorgeous! 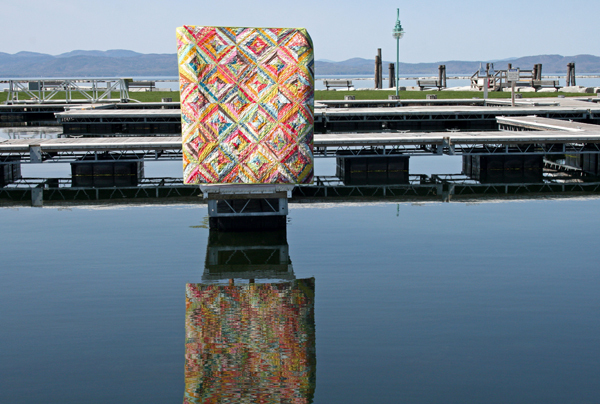 I love the reflection of the quilt in the water. 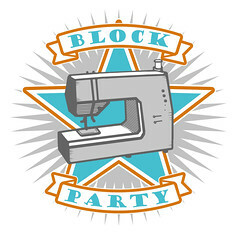 I’m using your string pieced tutorial for a virtual quilting bee right now and hope to make my own string pieced quilt. Do you know what green you used? Is is a Kona cotton? You’re killin’ me!!! 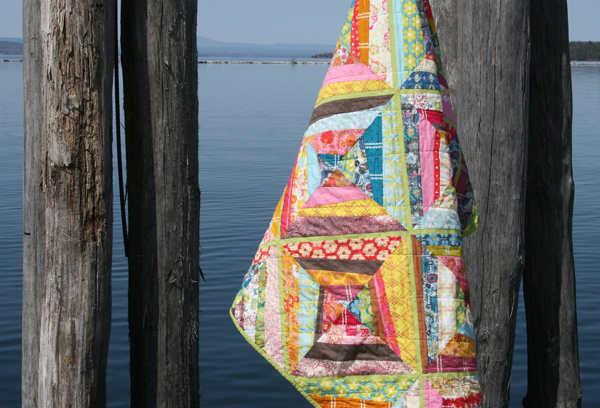 Gorgeous quilts AND beautiful photos…and I can’t find the time to do either. Oh well, I’m certainly enjoying yours! Beautiful Quilt! Off to check out the tutorial. You should be pleased….it’s wonderful! Love the overall look of this quilt. All those lovely fabrics harmoniously sitting next to one another. The green peepers look great. Beautiful!! I am working on a wonky string quilt, but it’s a little bigger, a queen size and it’s just left overs!! But I do just love your quilts!! Absolutely beautiful! I’m working on a string quilt also, but then you got me hooked on hexagons, so the string quilt has been left behind for now. 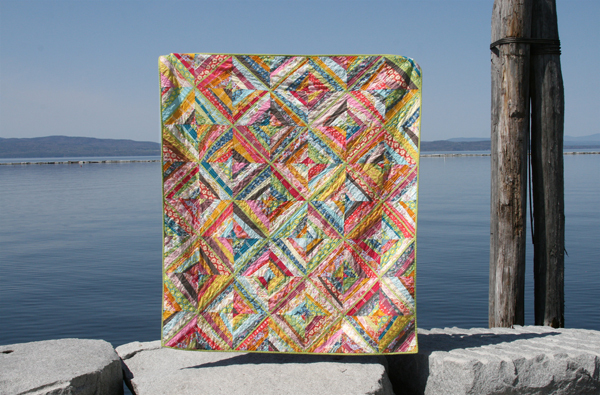 Be sure to check my website later this week for a Kaffe Fassett giveaway! Awesome job on the quilt & on the photography (as always). These fabrics sound so decadent. I must stock up on some based on your rave reviews. Your quilt is just gorgeous! I love the wonkiness of the strings, and the wonky quilting lines too. Love the juxtaposition of colors throughout. Wow, what a beautiful quilt! I know you must be proud!! I can’t wait to try one of these myself……..
I’m slowly hoarding (Um, I mean, acquiring) a stash of Little Folks and can’t wait to make a quilt from it. Actually I’d rather reupholster my entire house in voile, but my hubby says that is too extreme. Silly man. That is an incredibly beautiful and cool quilt!!! Great job…keep them coming! perfect! what a scrumptious quilt! also lovin’ the tufted tweets quilts! The place perfect. The quilts are absolutely stunning. Great post! Wow! Really love this quilt and the colors together! You amaze me at how quickly you can get a quilt finished. Thanks for inspiration! Hi Ashley–I just stumbled across your blog while looking for an Anna Maria somethingorother. I too am infatuated with Little Folks and have been using the voiles in everything I make. But I’m just learning to sew–now I must learn to quilt! This is positively gorgeous. My quilt top pattern is calling for solid fabric, and I plan on buying the solid voile from Fabricworm, so the entire top will be in 100% voile. Love the quilt and the pictures, as always! We get many prints done by Mpix. They have great service and shipping. I think the largest my hubby has had printed was 16 x 24. As a new quilter, I’m always checking out your site for inspiration. Thanks! truly gorgeous. I can totally see why you are so in love with this quilt. Awesome photo shoot too. That is one of the most beautifully made quilts I’ve ever seen. If I had your expertise I’d have at least one quilt in every room, including the bathroom! Love it! How about a wonky strings tutorial for us newbies?? This quilt is sooo amazing! Can I ask, is the center green string in a quilt weight cotton rather than the Voile? Also, when you cut your strips for the Wonky Quilt are you cutting wonky or cutting straight and sewing wonky? I’ve been looking through your posts, but can’t find the answer. Thanks Ashley, Love your work! Your quilt is amazing. Totally! I love the colors, the strings, the back. Everything 🙂 Good work! This is absolutely fabulous! I love all the colors and the way you quilted it as well. I started searching for Wonky quilts because somehow my latest quilt has wonkiness in it without the intention. I’m adding this to my list of quilts I want to do. 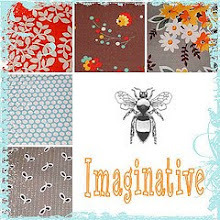 Imagine – doing Wonky on purpose!